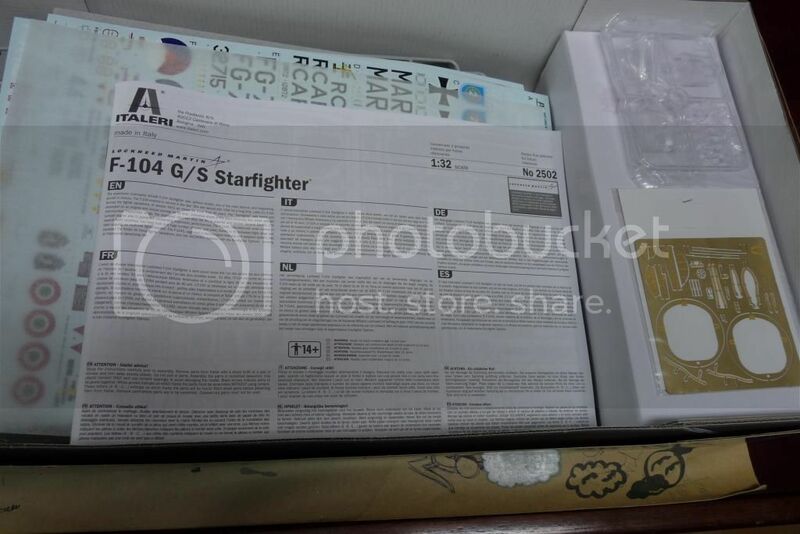 Inside, two big Starfighters from Italeri, and an Eduard Profipack Fishbed! The two big Starfighters were $50 US each - an incredible deal that I couldn't pass up. 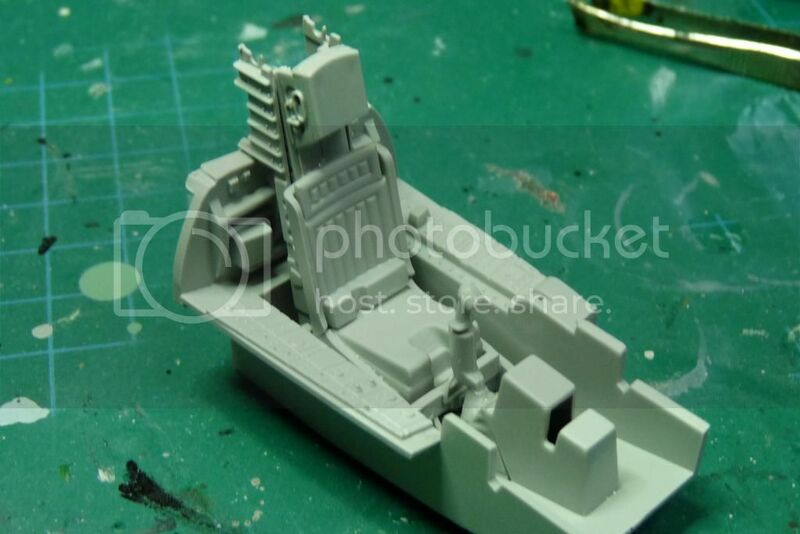 With shipping of about $18 for the three kits, and the Eduard Fishbed on special as well, it was surprisingly cheap. 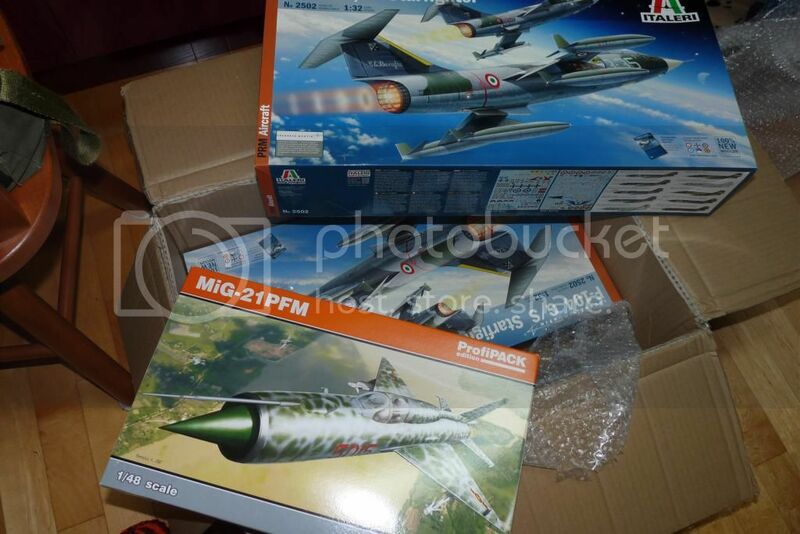 My plan is to build this first big Italeri kit completely OOB. 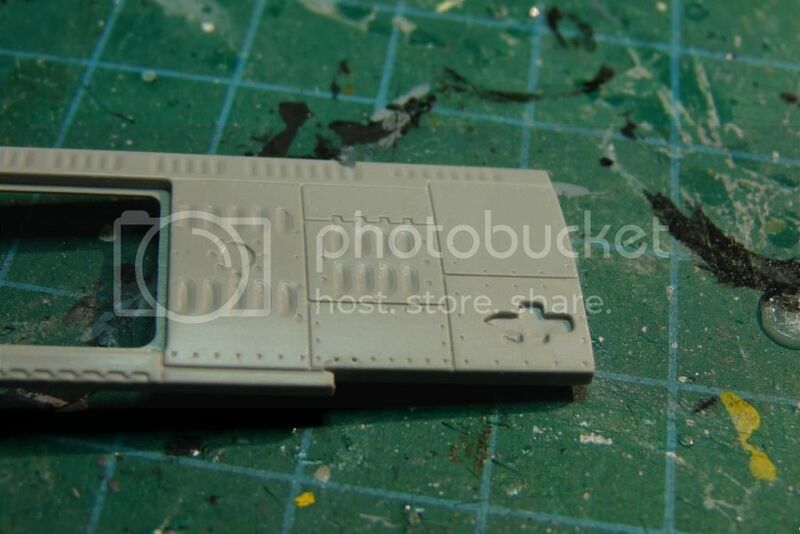 It will have the same paint job as my 1/48 Hasegawa did: the variegated camouflage pattern. After I have built this one, I will probably do either a natural metal with Alclad, or perhaps the overall-green scheme. I will evaluate with this kit if I want to buy any AM improvements for the next build. So far, this one looks really nice in the box. I love opening up big kits like this one. It comes with photo-etch, which I have seen dissed in at least one thread on this site. I love the idea of the seat belts and the canopy sill stuff in PE (like the break-out emergency knives and the canopy lock on the right side). 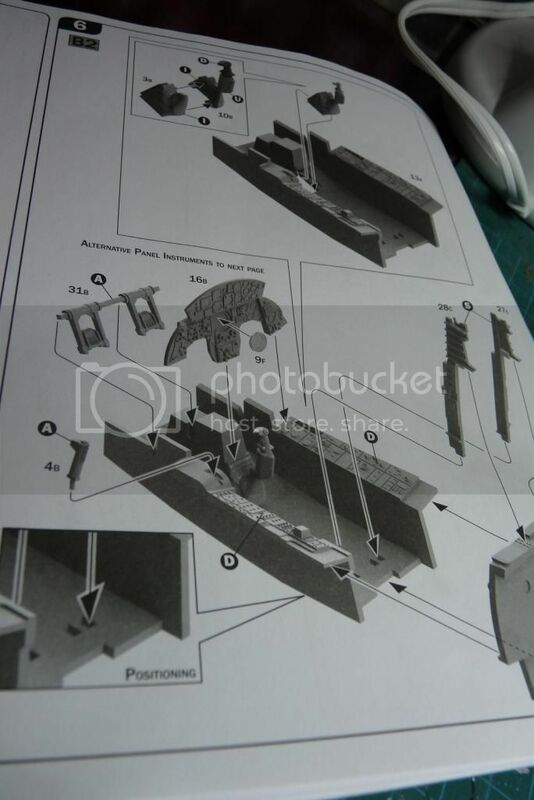 The instructions are beautifully detailed, and well-illustrated with both exploded and after-assembly views. They also clearly show the optional parts or steps for different versions. Nicely done, Italeri! There is also a terrific walkaround book, which is a bit biased toward the Italian version, but that's totally understandable. The decals are nice too, from Cartograf. I know Canuck Models has a better natural-metal version, but things I find great about this sheet are all the maintenance and pylon markings, plus the main instrument panel and nose-cone glare triangle. 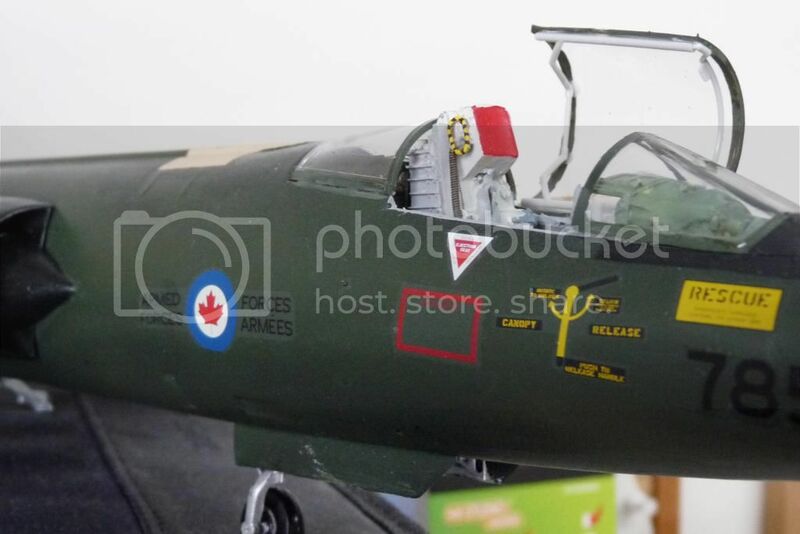 I also know that the instrument panel is not correct for a CF-104, but that is not important to me. I will attack this kit in the next couple of days, when I get time. I have a final exam (basic navigation) to create and send for printing first, but this week I have no more classes for the session and finals are the week of the 15th, so there should be some modelling time! 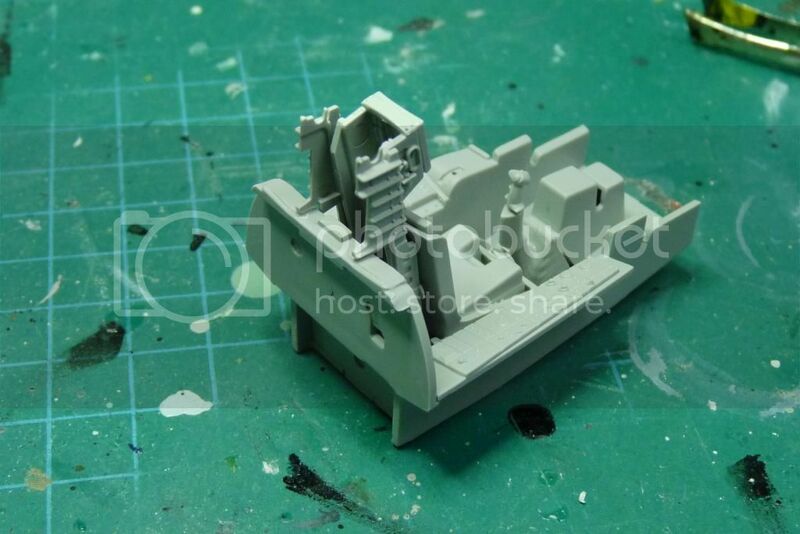 I will certainly be using his for the next Italeri kit I build, hopefully within this GB. I will likely do the overall green Tactical Air Meet (TAM) scheme with the red and white accents. Looking forward to your results on this one buddy. I've decided that since this is a kit that hasn't been around a long time, I will do quite a detailed build thread. Hopefully I will make a few good decisions, and several mistakes, that others can learn from. So far I am liking this kit. 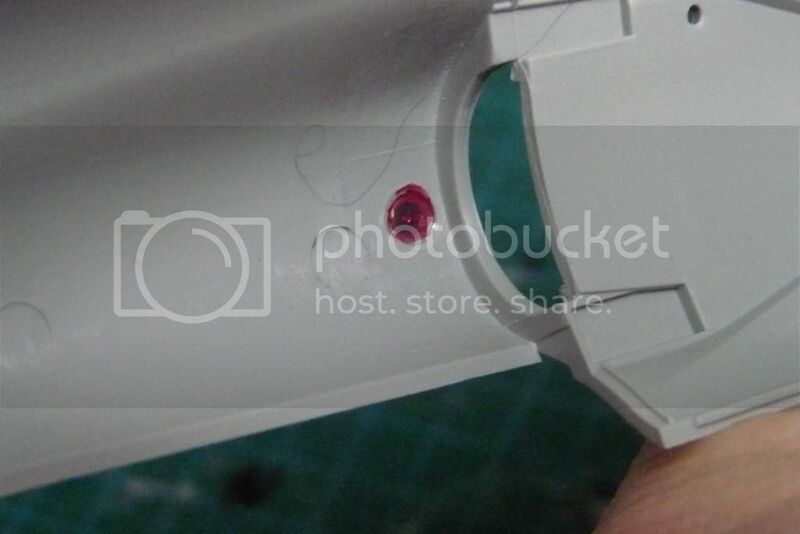 First impression is the plastic is a bit soft, but that just makes it easier to trim and cut. One of my big questions was the kit cockpit, including seat. I made a conscious decision to build this one OOB, just to see how good the kit's cockpit was. In a way, it reminds me of the Academy 1/32 Hornet kits. 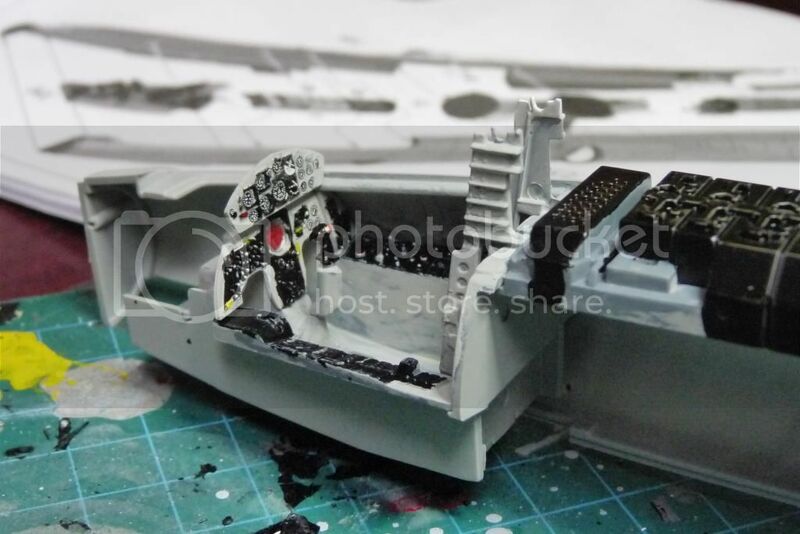 The instrument panels and other details are quite nice. The seat is so far looking better than the Academy Hornet seat. 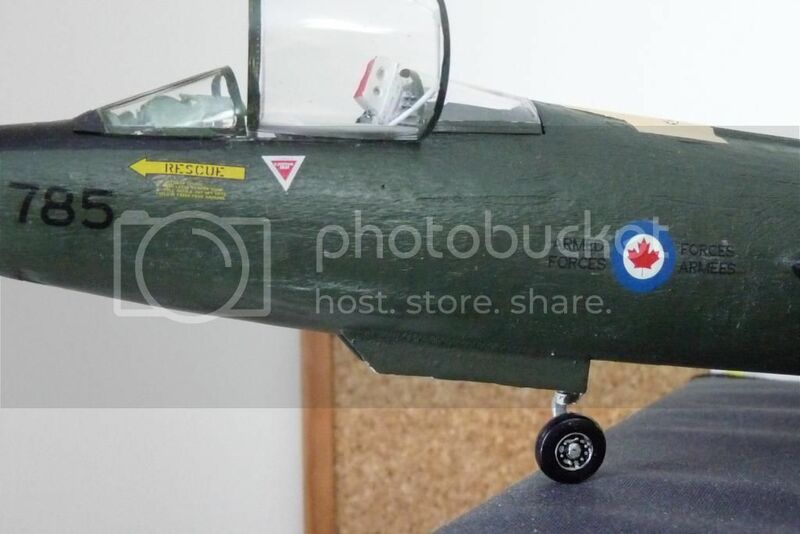 I am building the C2 seat (Lockheed, not Martin Baker), for the CF-104. One problem with this seat is it has rails at the back and has to fit into other rails that are attached to the cockpit rear wall. 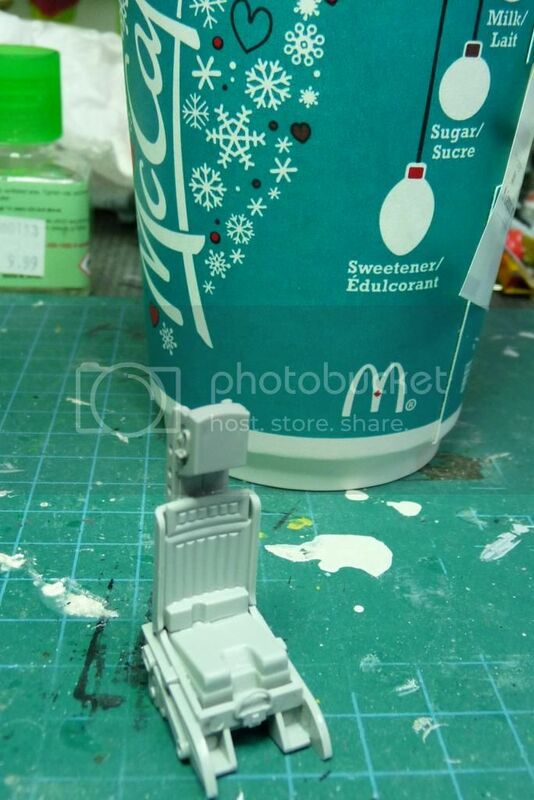 The instructions are good; they give clear indications where to glue stuff, and the parts themselves have little notches and locating areas that help get things in the right spots. 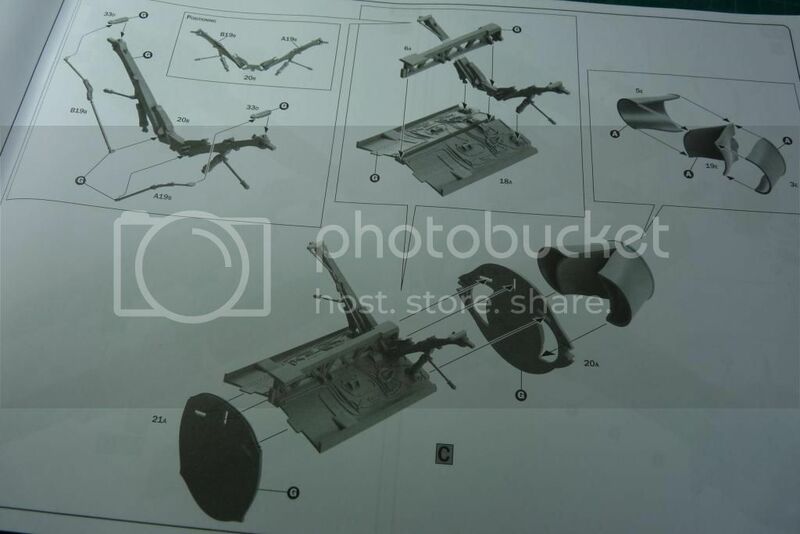 The seat comes with lots of parts. 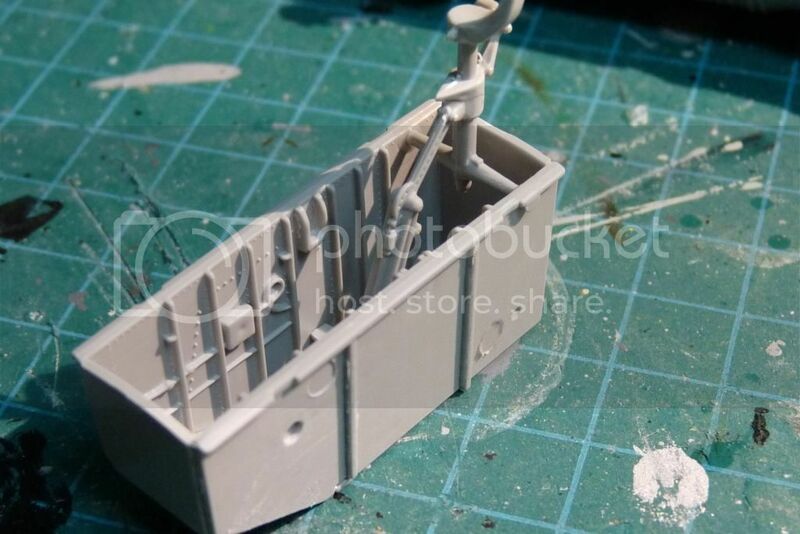 Most are on sprue D, of which we get 2 in this kit (because of the fuel tanks that are on it). Without going through and counting every part, it appears it may be possible to make two of each C2 and MB seats with this kit. Is this heralding a two-seat version sometime? When I look carefully at the fuselage around the cockpit area, it looks like it is moulded for two seats as well. Is there something I don't know about upcoming releases? The instructions show (as I said) where to glue stuff. Look at parts 11D and 25C (seat side guards and seat pan). Both show dotted lines where they go together with themselves, and the seat back. Nice. When I dry-fit the parts, I noticed there is a little notch in the seat pan that locates it beautifully on the side guard. I like it when things are clear like this. Note also that while there are sink holes, they tend to be in areas where they are invisible. The same thing holds true for the two-part seat back. There is a little ridge that the other one sits on to ensure proper alignment. Nice. More in the next post, where I have made my first small mistake. Now for the promised mistake. One thing that is unclear is what angle the seat back sits at. If you glue the back down onto the seat pan where the dotted line is, it leans forward a bit (at about 90 degrees to the seat pan). The side portions look a bit off... but there WAS a dotted line! I found out the best way to locate this properly was in a later step. Here's where I glued it at first. Seat and cappuccino both look very inviting. Here's where I DIDN'T make a mistake. 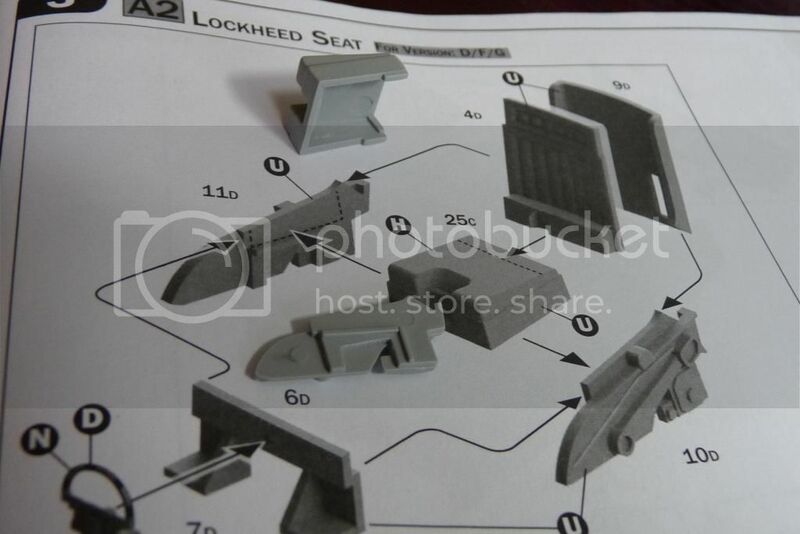 The cockpit assembly has about 4 different options (with/without decal, with/without side panel PE, C2 vs MB seats, etc). 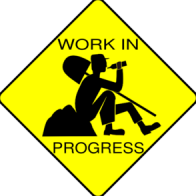 The one I am making (version D, which becomes assembly step B2) is in this graphic. I had a close look at it, and noticed that the rear seat rails go in the outer locating holes for the C2 seat, vice the two inner holes for the MB seat in the diagram to its left. Notice the little call-out titled "positioning" that shows the arrow going clearly into the outer hole. So far so good. I glued the back wall in place, then dry-fit the seat in with the rear rails. I didn't take a photo of that arrangement. I pried the seat apart, and reglued it at the proper angle. 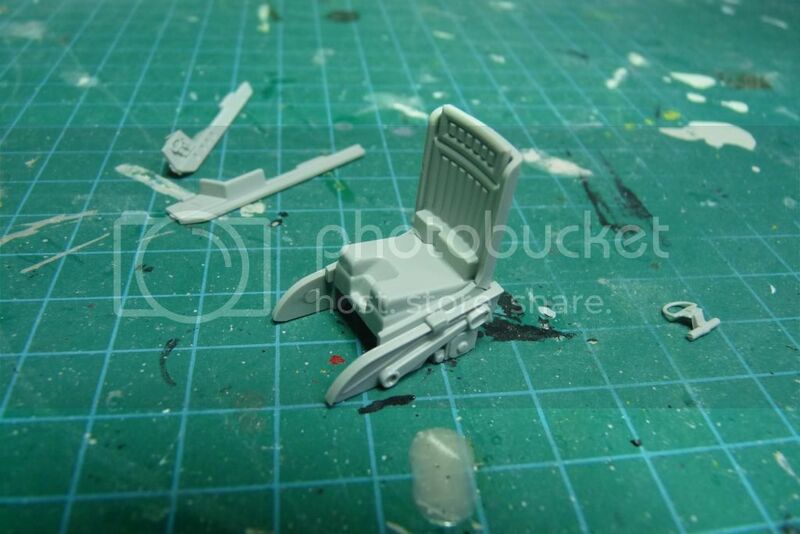 While it was setting, I dry-fit the whole seat in with the rear rails in the cockpit as below, to make sure the angle was OK and that the rear rails were parallel and properly seated, so to speak. 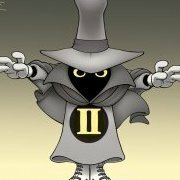 Not a huge mistake, but hopefully a technique that others may find useful. 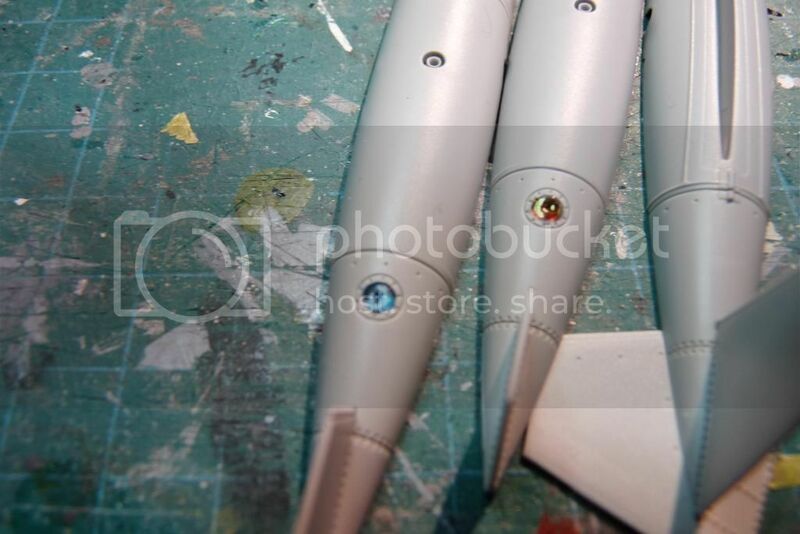 Here are the sub-assemblies, about to be painted with XF-19 grey. That's where I leave off for the evening. Honestly, the kit parts look pretty good to me. 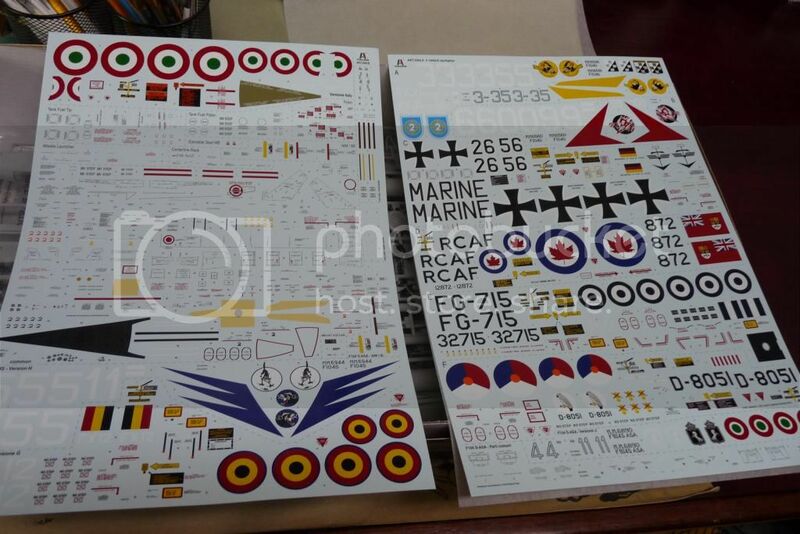 I am planning to use the instrument panel decal, and will evaluate the PE vs plastic side panels. Does anyone know how to paint the PE so it looks better than the plastic side panels? Looking good. I think I'll probably have to get one of these kits eventually. 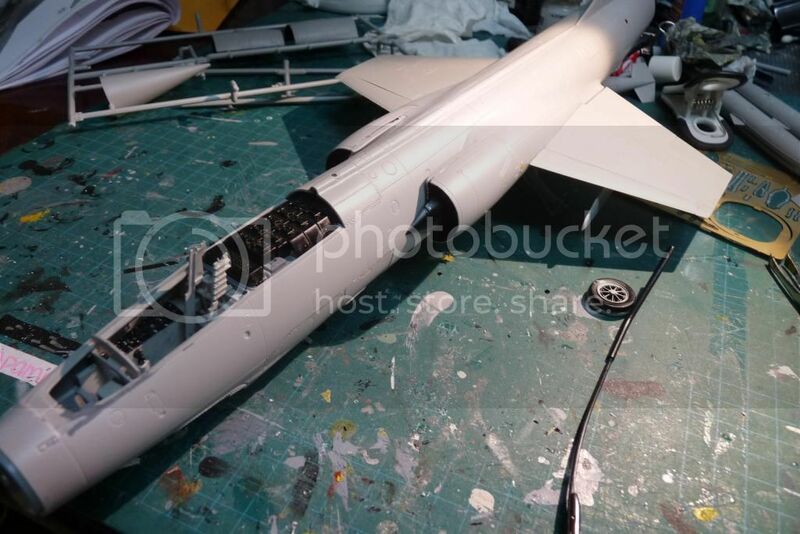 I was hoping the rumor that AFV Club was going to make a 1/32 F-104 was going to come true. That would be a nice kit. I see you plan on using XF-19 for the pit. I've found that XF-83 is a perfect match for FS 36231. Looks like mine was on the same ship has yours! got one of these in the mail Friday! Cant wait to see this one built! im taking notes! Looks like I need to buy some XF-83, then. Thanks for the tip John. I'm probably going to pick up one of these gems after Christmas. Thanks for your insight and information ALF. I've never painted photo etch in my life. Until someone comes along with a better answer than this, what about giving the PE a bit of a scuff with some 1000 grit sandpaper? Just enough to give the paint something to bite into? Sorry, dude - can't help it. It just comes naturally. Just be thankful that you, as my friend, don't get this full-time. My kids are sick of my constant teaching! "Here's the technique" they often say, sarcastically, as I am about to say exactly that. I thought about roughing up the PE a bit, but some of the surface is a big rough already... previous experiences with painting it have been OK (inside cockpits). Obviously, if it's on an outside surface, it needs priming, but in this case it would have been all right with no priming or sanding. A minor offset on the decals, but tucked away under the coaming, it looks OK to me. 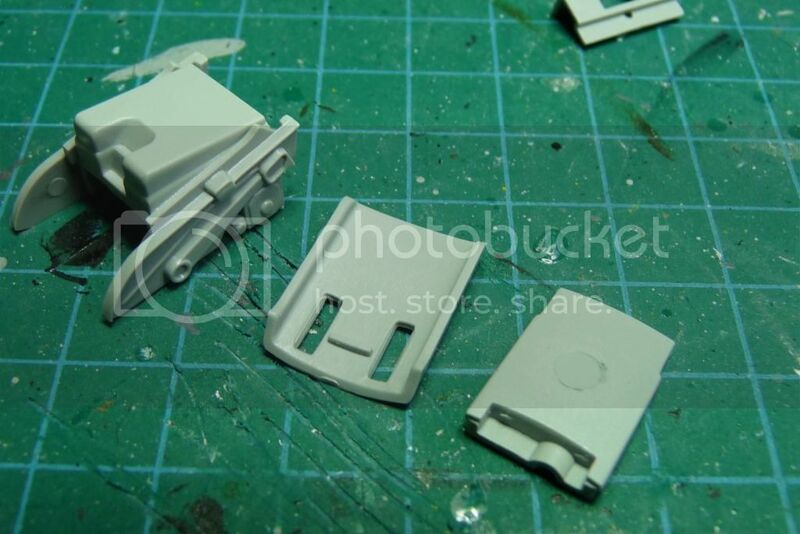 I was amazed at how closely the kit's parts breakdown resembles the 1/48 Hasegawa. Amazed, but not at all surprised - that is one of the best kits I've ever built. Why mess with great ideas? Here is the main gear strut part. 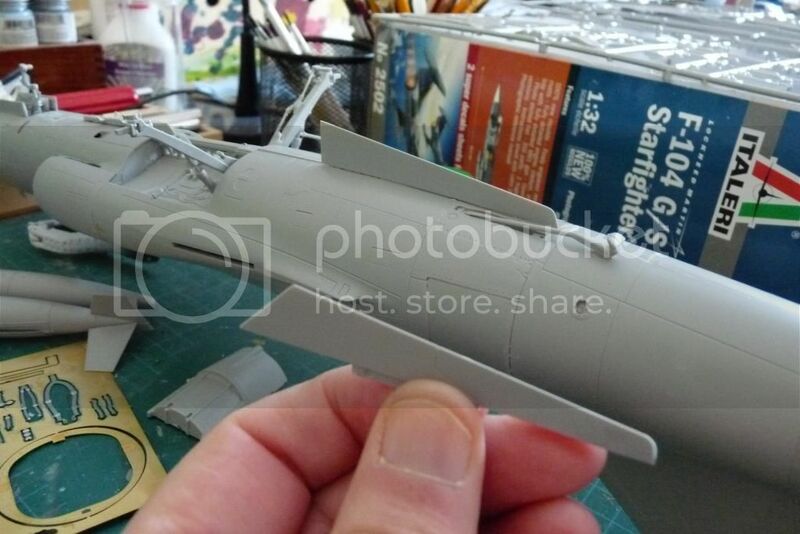 It is very similar to the Hasegawa one, and the extra bits that get glued onto it are virtually identical. On the improvement side, the instructions are extremely clear on what exactly gets glued to what. The negative side is the minor flash that needed to be cleaned up. Look familiar? It should. One difference is that the rear bulkhead has tubing for the air flowing into the engine face. 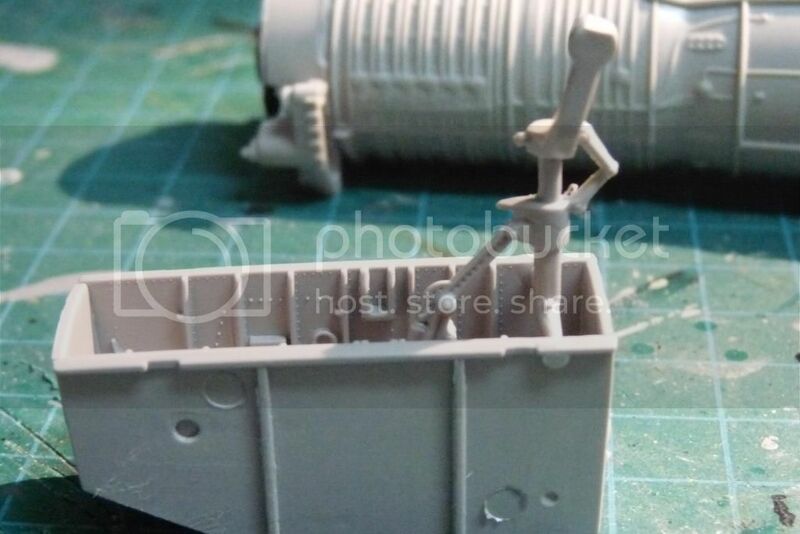 The engine comes with lots of little detail parts. 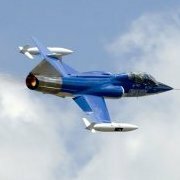 I'm sure that those with AMS will not be satisfied, but the reality is that jet engines tend to be rather dull on the outside. I jazzed up the flame holder/turbine rings with some silver Sharpie after taking this pic. It is buried quite deep in the engine, and won't show unless you shine a light in there. Thanks again to CF_104 for his hints on cockpit colour. Too bad; my LHS does not have those colours (I think the higher end in the XF line are newer ones). I will order some for later builds through the hobby shop, but in the interim I looked at other options. Here are some. Two of them are too dark (the wingers), while the centre option is too brown and not bluish enough. I finally ended up using JA grey; it is a bit darker than XF-19, and more blue/greenish. Not perfect, but not grossly far off. Looking at the e-bay from underneath, you can see just how nicely it fits with the cockpit tub. 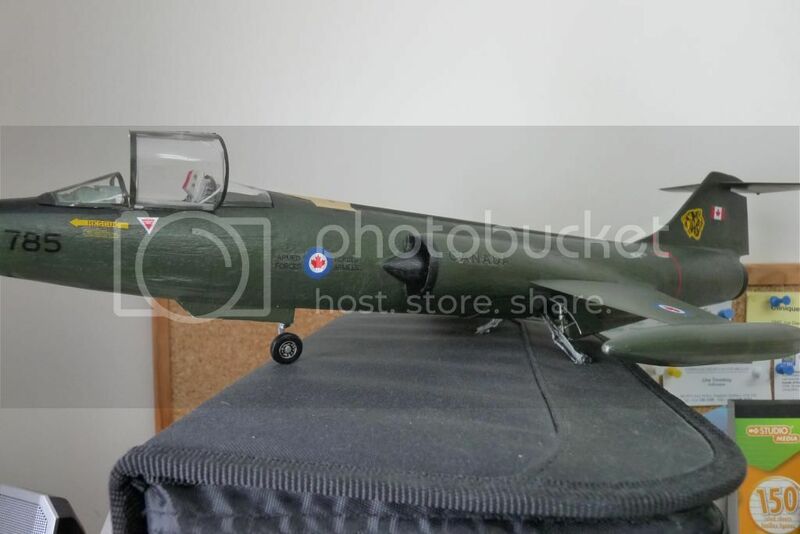 After doing a 1/32 Starfighter with a resin cockpit not too long ago, and having quite a few problems with the trimming and fit, this was a real dream to install. Here's what it looks like from the top and side. Does anyone know what colours I should paint the e-bay items? Any pictures? This will be the first kit I build with this panel open, and I would like to get it relatively close. Is it not a parent's prerogative to annoy their children to no end? It must mean you're doing a good job if they know what you're going to say. The message is constant. That's a lot of flash on the main gears for such a newly tooled kit. You'd think for something so recently released there would be less flash than that. I can't help you directly with the colours for the interior of 'e-bay' but I'll ask Des Peters who flew them with 422 Sqn. Not sure if he knows the answer but you'll never know if you don't ask. I'll let you know what he says. 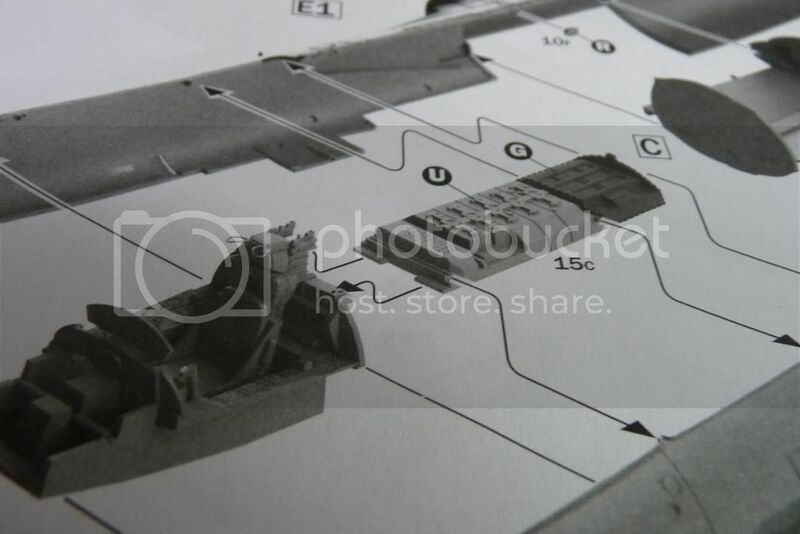 I found a great picture showing the electronics bay. I've cropped it, because it has a candid shot of one of my father's very good friends - someone who is well known to the ARC community as the author of the authoritative reference book "Starfighter", Dave Bashow. My dad took the shot when they were on 439 Squadron together in Baden, Germany. 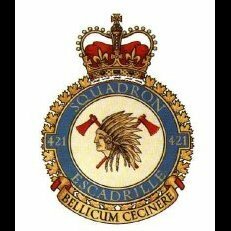 I came across the photo as I was reviewing old Squadron photo albums from various eras; I am working with some people that are putting together a 439 Squadron history book, in English and French, similar to the one we did about 425 a couple years ago. It was a huge trip down memory lane for me, to see a bunch of photos of my parents and their friends as they lived the experience of being on a 104 squadron in the height of the Cold War in Germany. My father was the one responsible for taking care of the squadron photo album from 1972 until about 1977; there are lots of memories in there. Anyway, here's the picture I referred to. It shows that the surroundings are the same grey as the cockpit, and the black boxes have few highlights, and the cabling is a light grey or silver in colour. It's enough to do something relatively good-looking. It's also interesting to see that the dark green under the rear portion of the canopy extends right down along the front of the e-bay door. Goodnight for now; I have two exams to give tomorrow, and I need my beauty sleep. Short update. 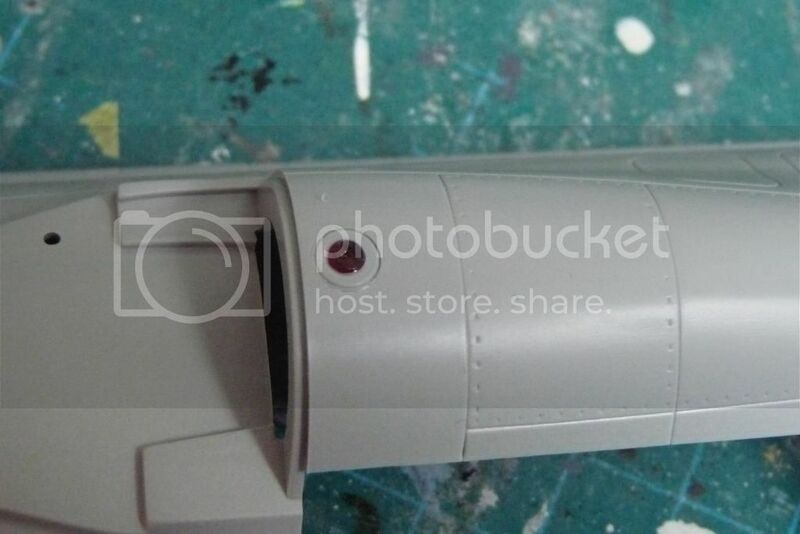 I installed the position lights inside the fuselage (aft of the intakes). I coloured them using permanent felt markers on the inside. I will mask the outside during the painting process. I like the effect this gives. 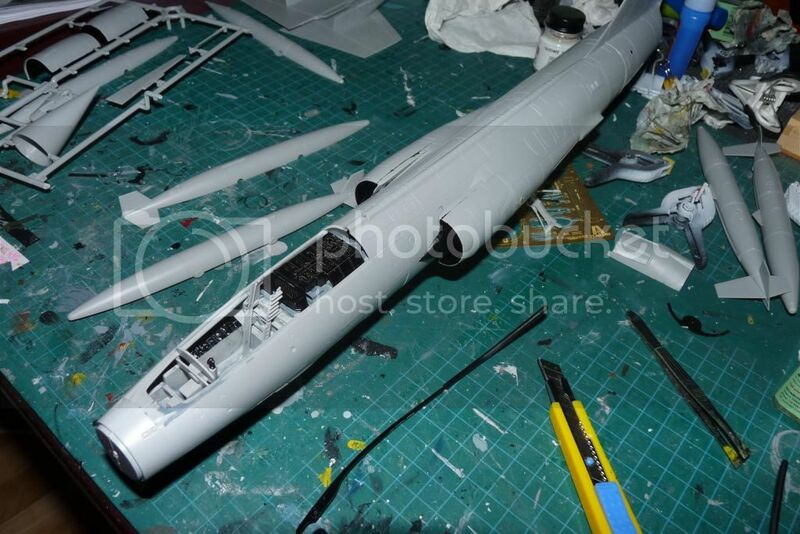 Stuff all glued into the right fuselage half. Foreboding note: I should have waited to glue the engine in place. For those who are curious, this is how the inside of the engine looks. Even with a flash, it is hard to see the flameholder assembly. 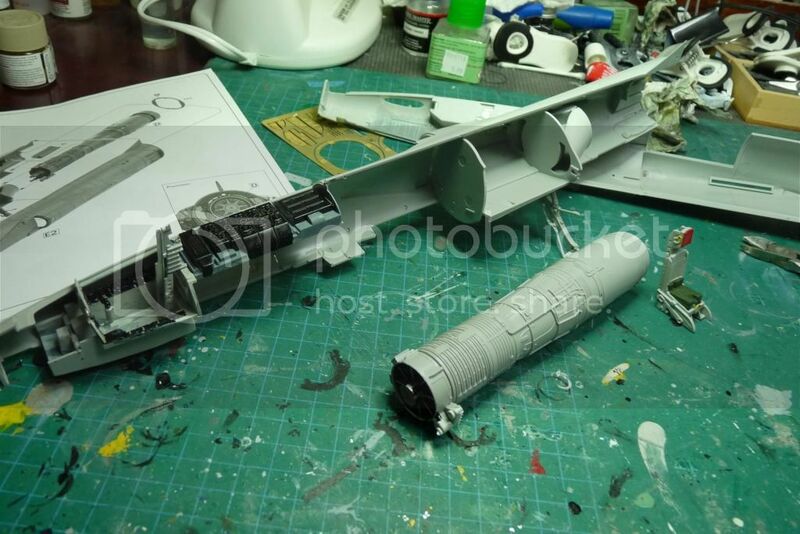 The nose gear well comes in 3 main pieces (top and two sides).The secret is to glue stuff in place all at once up to this stage (including the nose strut and the brace, so that the angle is correct). 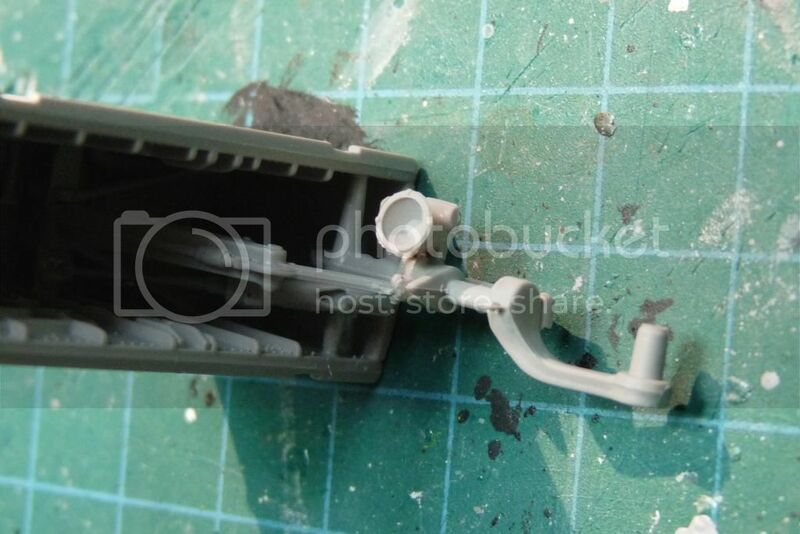 I like the way it is easy to get the right position for the strut bracer. I have yet to add the landing light and its holder; that will come much later. Remember the foreboding about gluing the engine in place? 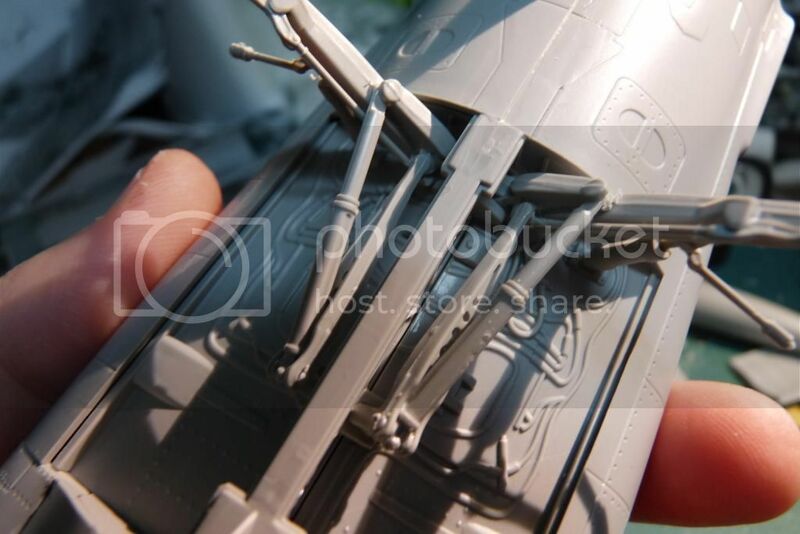 I found that it accentuated the gap between the rear fuselage halves and the front fuselage. 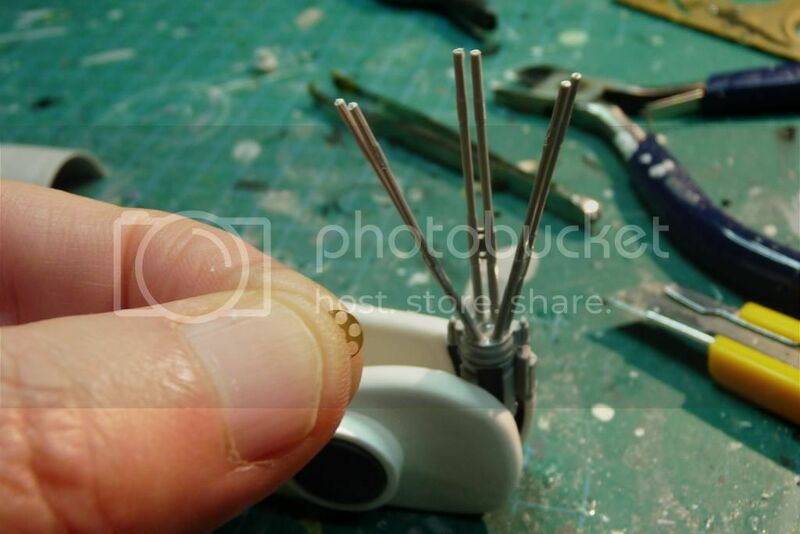 I was able to gently twist the engine out; it is designed to be inserted and removed from a completed model, so I am not worried about reseating it later. 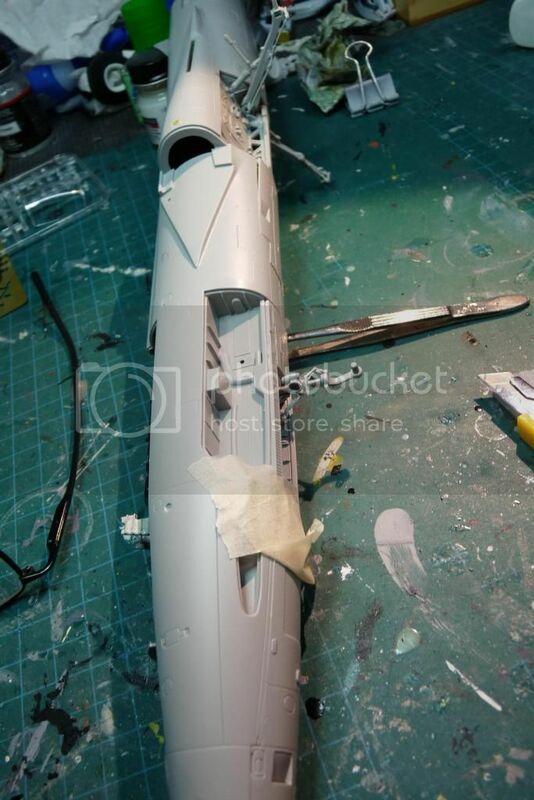 For the big Hasegawa kit, I usually glue the front and rear fuselage halves together before assembling them left/right, because the front/rear joint can be large if assembled separately. For this one, I experimented. At first, with engine in place, it was impossible to get a good fit by any means. After removing the engine, it's looking better. 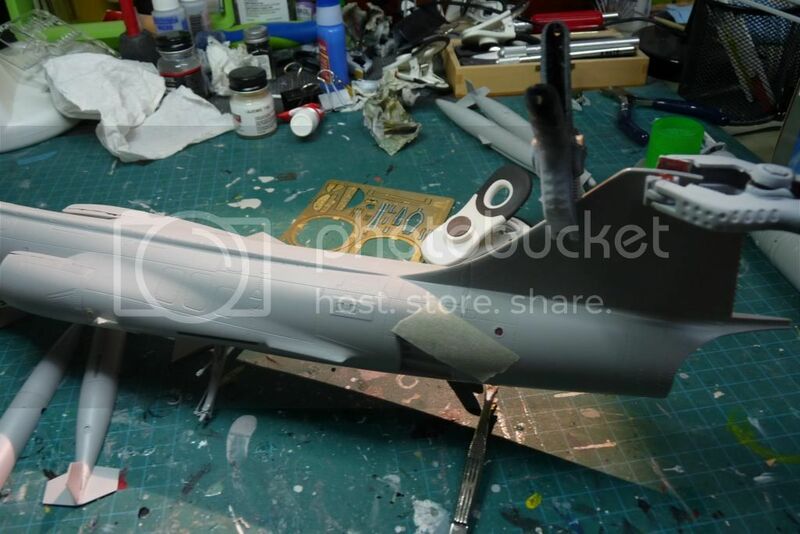 I will decide if I simply clamp the vertical tail portion, then glue the front face of the tail to the aft fuselage, then glue the tail left/right together, or if the fit is good enough to glue the left/right tail first, then onto the rear fuselage. More dry-fitting to do before I make the decision. I was all excited today; the decals have arrived from LEM! Joy was short-lived, though... they are the wrong scale. I got 1/48; my Paypal receipt says 1/32. I have sent an email to LEM asking what next. Here's a suggestion for your position lights. Once you've tinted them paint the inside over with silver or chrome paint. This will give them some added depth as they will reflect the light back through the clear lens. Have you two been talking? Thanks guys. I'll do that. 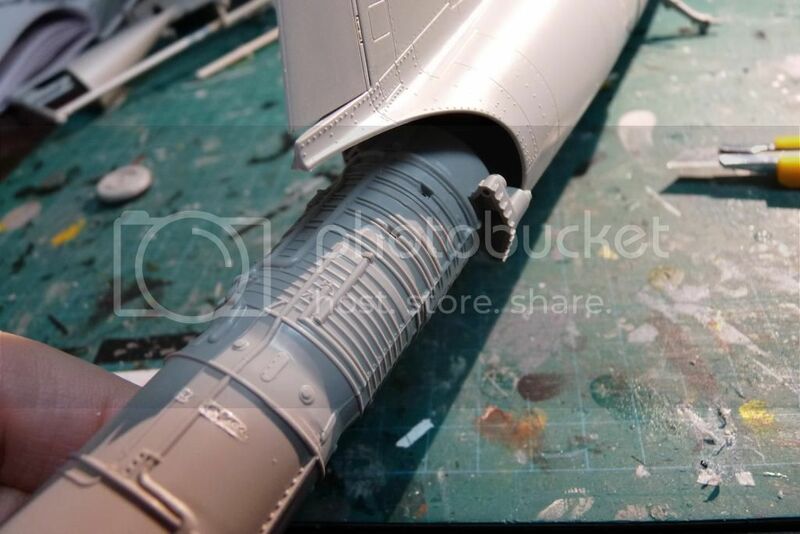 Too late for the ones behind the intakes, but will do it with the ones inside the tail and the tip tanks. Got your message along with the photo. Thanks. Sorry for the delay in responding here. It looks like Des wasn't too far off with his dull (flat) black boxes and white cables. Good luck. Really? Are you sure you're not the only person to think of that? Why should I take just YOUR opinion? Now give me a few hours to get the silver applied, and pictures taken of it, so I can get the peanut gallery to shaddup already! Good news on the LEM decals front. I e-mailed Dave Koss, and within a few hours he responded with a "sorry - I'll get yours in the mail tomorrow." This is the bottom piece, aft of the nose wheel well. 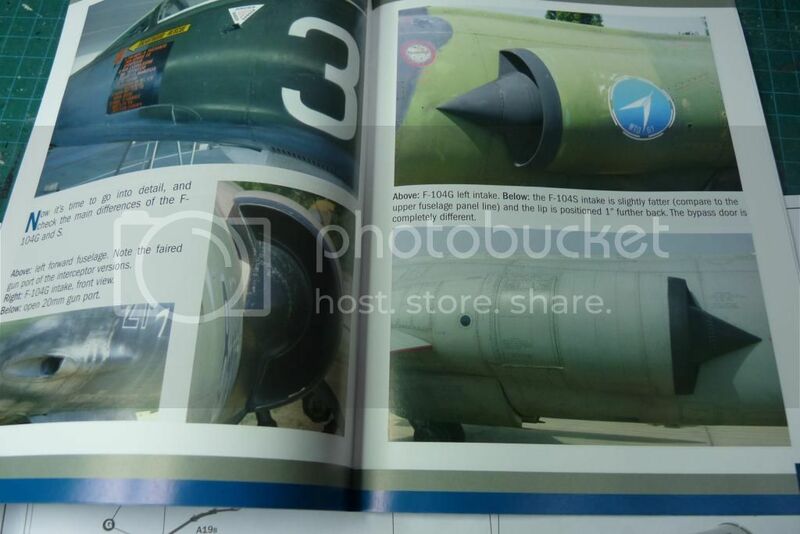 The little indented shape here is for the empty casings chute from the gun, but CF-104s didn't have them. I was going to fill it with a chopped-off part from the chute itself, but it only fills part of the hole, so I'll just use filler on it. I installed the casing for the nose gear taxi light. Lots of flash to trim on these parts. I'm leaving the wheels off until the end, to facilitate painting and masking. 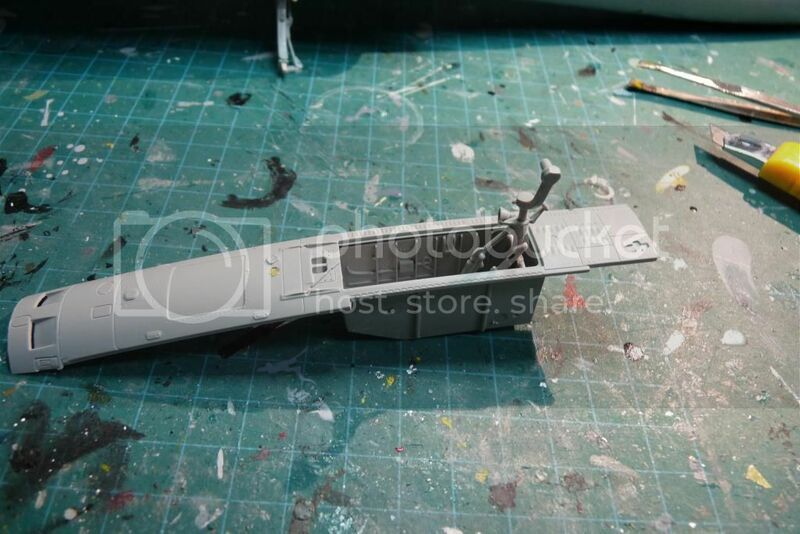 The whole under-panel, including the light which has had silver applied to the inside part, and Tamiya tape applied to the exterior part. Nose wheel part installed. It took a bit of tape to hold one part in place, but the fit was great. Now I'm debating what to do about the Vulcan cannon. I was not sure if I wanted to have the gun panel open for viewing, or closed up. In researching colours for this area, I went through dozens of CF-104 pictures I had on my hard drive, plus a bunch on-line. After taking forever to find one or two with the interior showing (i.e. 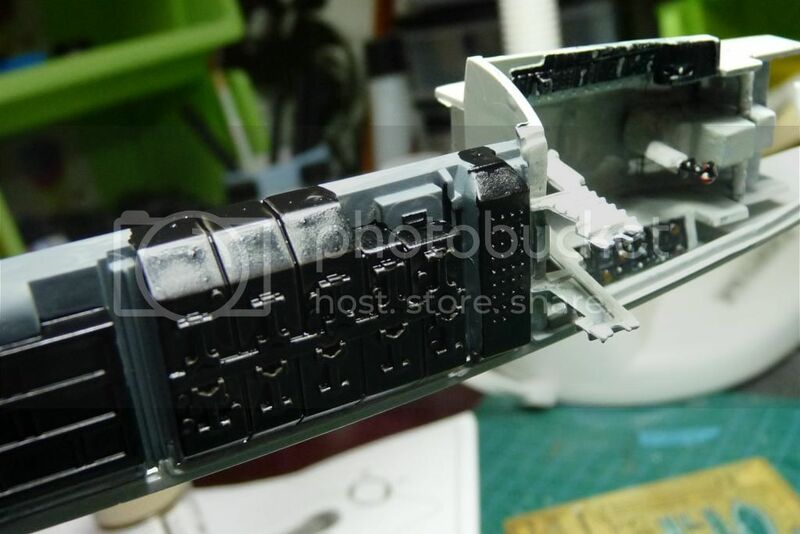 panels open), I figured out that the gun is gunmetal (duh), and the bay and door insides are white. It was only after it took so long that it occurred to me that it was not a common occurrence to have this door open, and I also didn't want to have loose parts lying around all the time. That's when I made the decision to close up the panel anyway. As I did the research, though, I decided to build up the canon just for fun. Here's how NOT to do it. 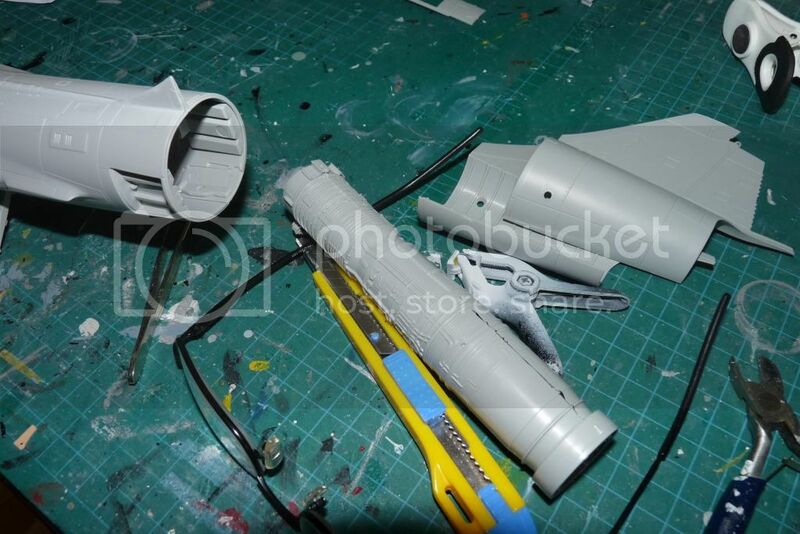 Do not do what I did, and glue the bases of the 3 parts (2 barrels each) to the main gun. Even after I used a clamp to hold the base in place, I still found it quite challenging to fit the tiny PE part over the barrels all at once. 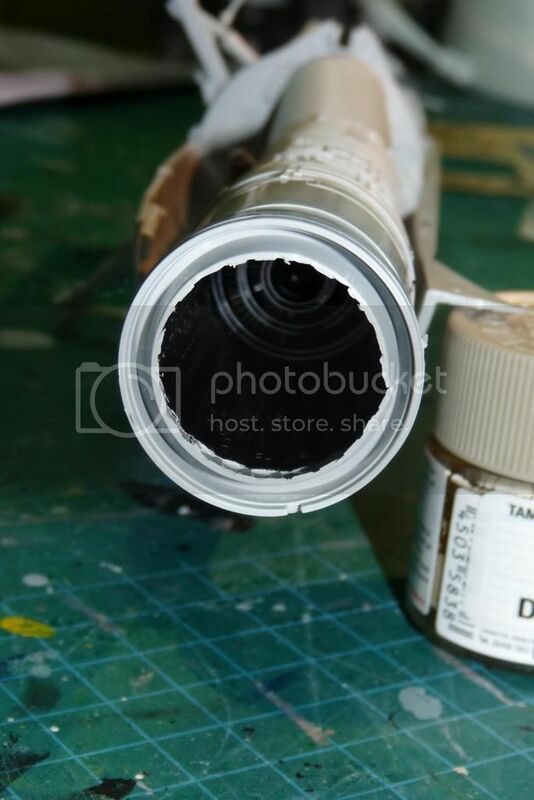 I ended up pulling the barrels out of the end part, inserted them all into the PE part, then glued the ends into the main gun breech area and finally attached the other end. 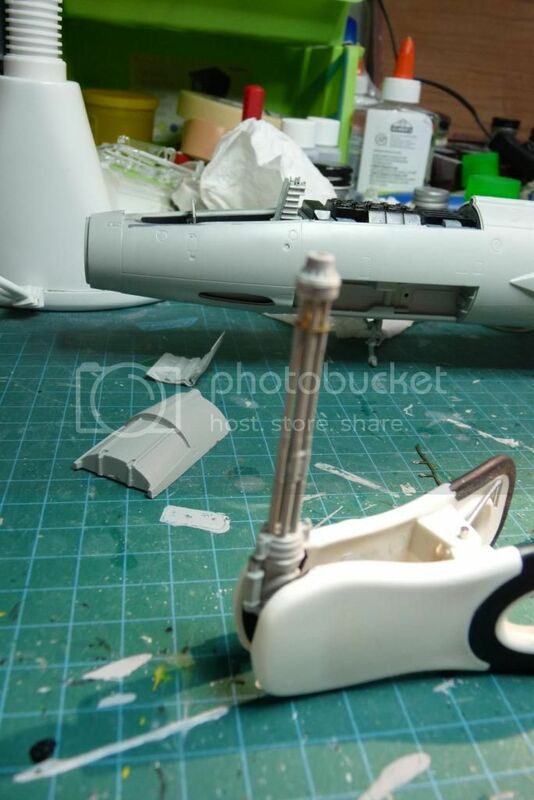 -In my happiness to see the excellent fit of the wing parts, including leading edge flaps and ailerons, I glued them together, and only afterward realized I forgot to pierce the two holes for the underwing pylons. 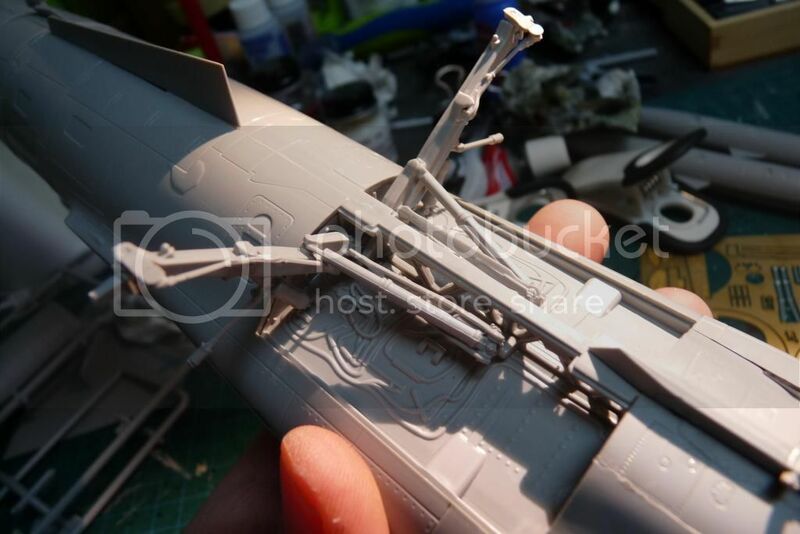 -The fuel tanks are different from the 1/48 Hasegawa. 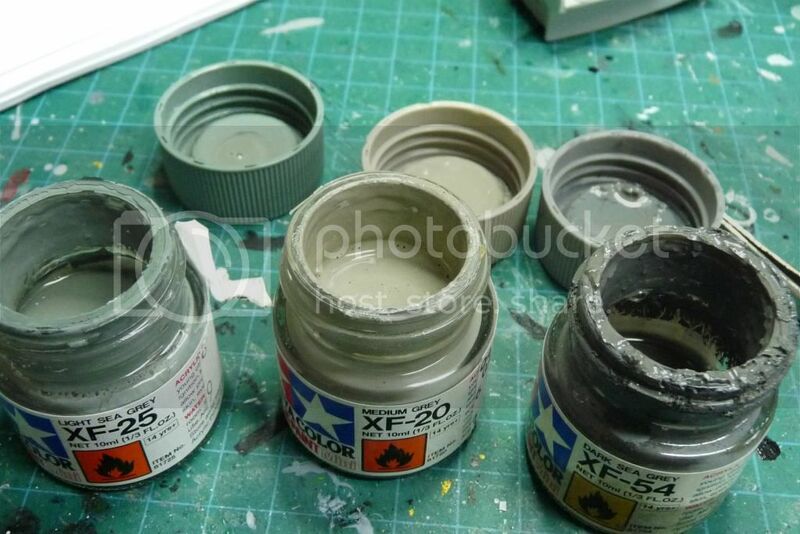 There are (just like the Hase kit) 4 fuel caps, but these ones need to be installed before gluing the two tank halves together (the Hasegawa kit's caps fit into place after the tank halves are glued together). One of the fuel caps ended up being a bit indented into the tank; this will be hard to cover up. The solution is to glue all 4 in place on one side, pressing them into place from inside and ensuring that the angles are correct. I did that. What I didn't do was WAIT until the caps had dried in place before gluing the tank halves together; that's how one of mine ended up being indented a bit on one end. There are, of course, a few things I did correctly. 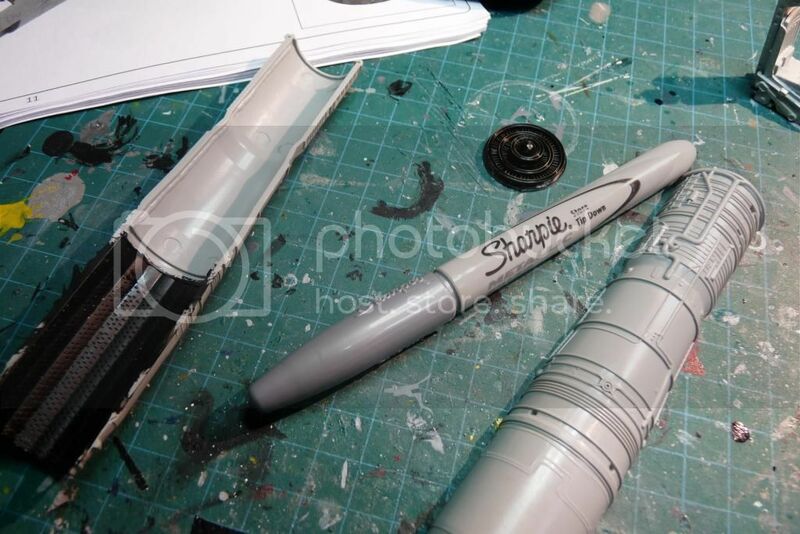 Thanks to the peanut gallery I applied silver pen on the inside of the lights, then blue/green and red magic marker to the outer part, and here's what they look like on the tip tanks. As promised, they do have lots of depth as a result. Thanks for the tip, amigos! Another thing I like about this kit is the way the fins attach to the tanks. 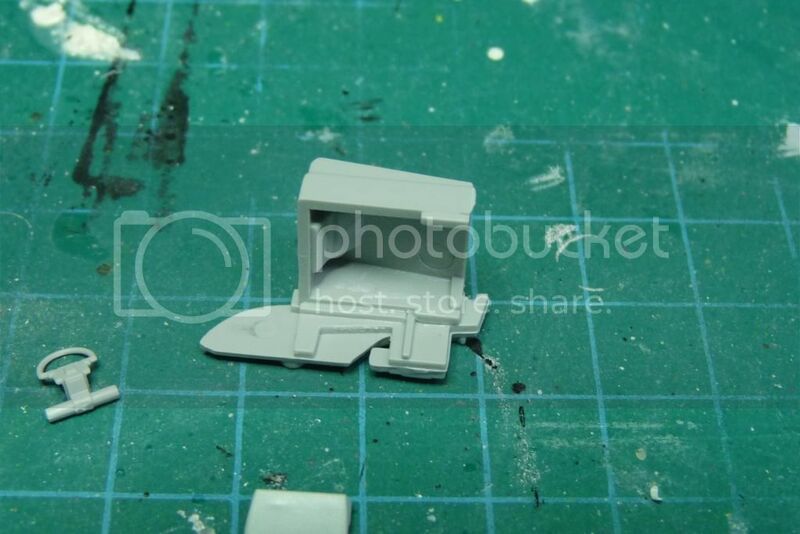 First of all, the angle for the tip tank fins is correct, contrary to the 1/48 Hasegawa. 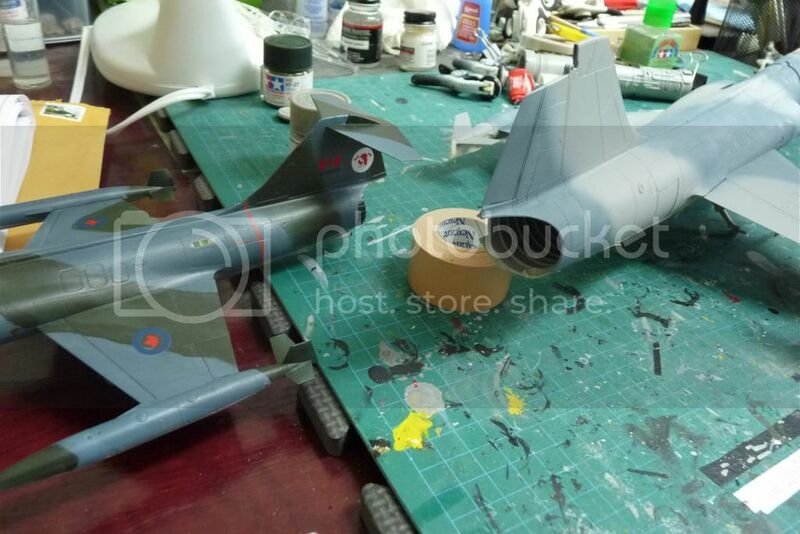 The fins will end up parallel to the wings, and not parallel to the ground. 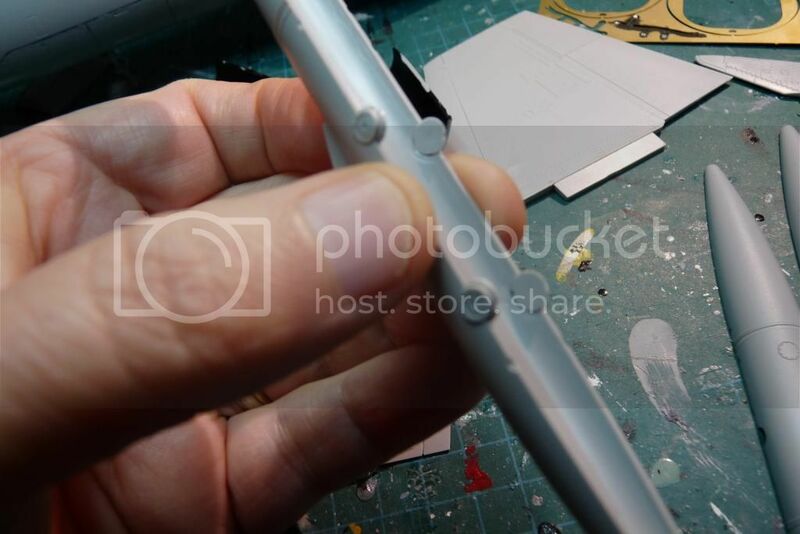 It is possible to glue each fin in place before gluing the two halves together, thus allowing a nice straight angle when drying, to ensure a 90 degree angle. You can see on the right side of the photo above that the fins are installed. I used a bunch of clamps for each tip tank. Fit was fairly good, but the front ends needed some pressure to match up without leaving a gap. With the aft fuselage, I also did the same job on the lights for the red ones (silver inside, red outside), then held the vertical tail halves together with a clamp while I mated the fuselage front/back segments. Fit was OK; a minor gap along the panel line here. After the fore/aft part was done, I added Tamiya extra-thin cement into the gaps between left and right halves, and clamped them again. I have glued more miscellaneous bits here and there, including speed brake covers in place. Fit was great for that, as was the fit for the gun doors. You can see in the very top part of this picture that I have attached the pylons to the wings. I studied the excellent instructions, did some dry fitting, and confidently punched out the holes for the locating pins from the outside. It worked! The pylons are on, at angles that will be perpendicular to the ground after the wings are glued in place. I will not be gluing the pylons in place until after they are painted, to facilitate masking. 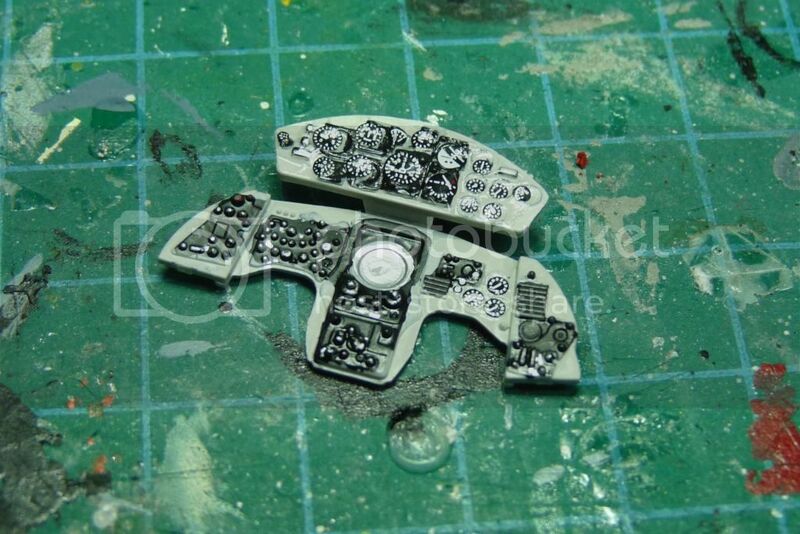 In this variegated scheme, each of the underwing tanks is camo on top and grey on the bottom; it would be hell to mask it all when glued together. A very Merry Christmas to all my ARC friends. I hope you had a great time, whatever or however you may celebrate at this time of year. Time for an update. I did get some time for modelling, amid the obligatory family get-togethers. I finished up the assembly prior to painting the primer. One thing to play close attention to is the ventral fin, depending which version you are doing. The fin in my hand is the one for the 104S Italian version; the one glued on the model is the G and all other versions. I had glued the wrong one on at first, just going through the sprues and gluing stuff on that looked like it went in certain places (what, me, follow instructions?). Then I was doing a quick review of the instructions, and I realized that I glued the wrong fin in place. The glue had not yet set, so I replaced it with the correct one. The major difference is in the angle of the leading edge of the fin. The Italian version is swept backward, while the other one is almost perpendicular. 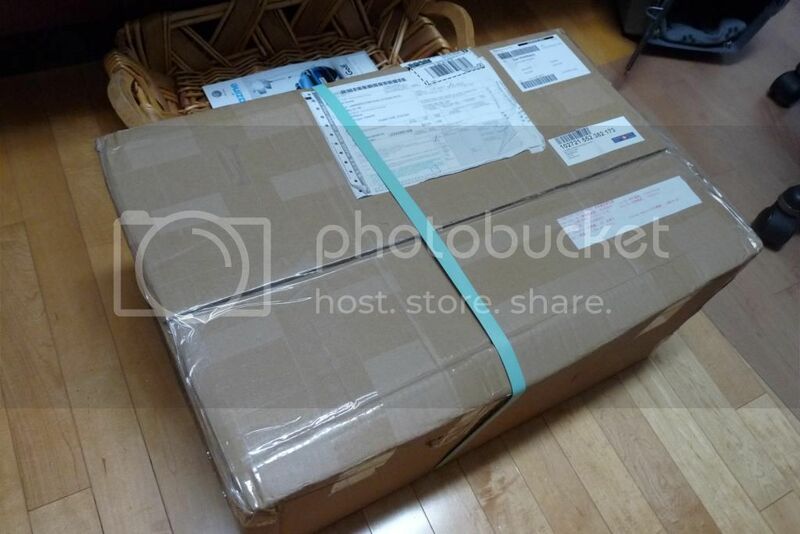 Here is the donor kit. I call it Jekyl and Hyde because it has one side that is fairly smooth, and the other side is horribly disfigured. 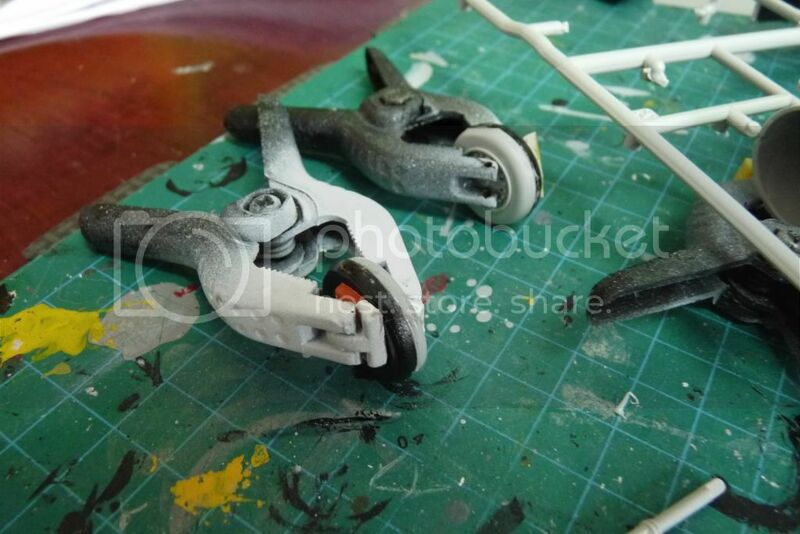 Thanks to Neo, who gave me the tip, I was able to add a bit of Tamiya extra-thin glue to the join where the wheels were attached, and they came off quite handily without damaging anything. Humming happily, I dry-fit the wheel... only to see that the attachment point on the Italeri kit was a small spindle, while the Hasegawa kit had a huge blocky part. Therefore, the hole in the Hasegawa wheel hub was way too huge for the Italeri kit (you can see how it pivots freely here). 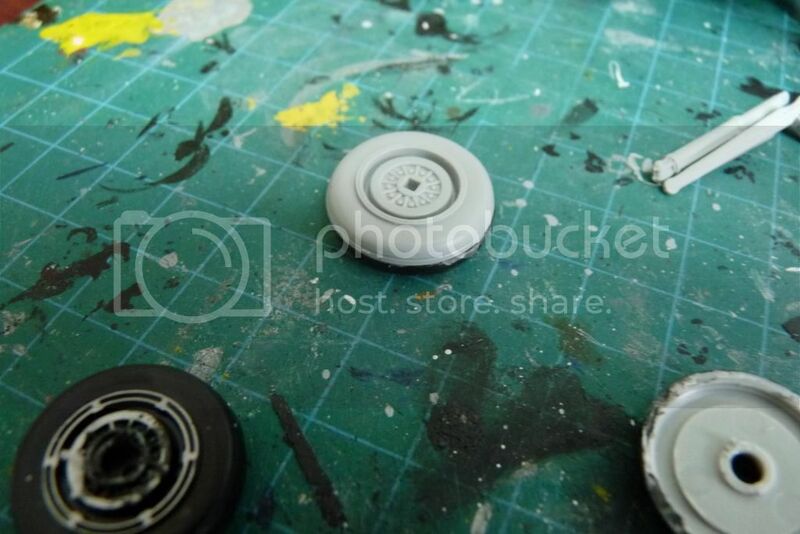 Tamiya on the left (wheel with the filled-in hub), and Hasegawa on the right. Hmmm. What to do? 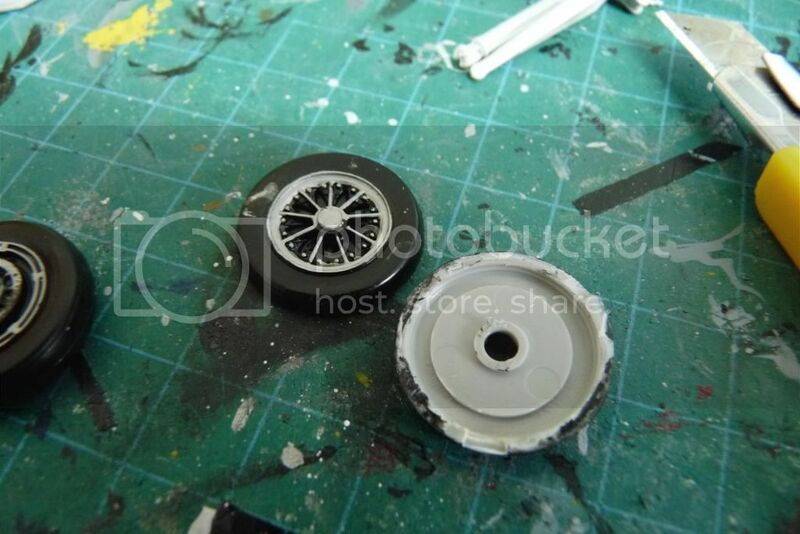 I decided I would see if I could split the wheels apart, and mate the spoked outer part from the Hasegawa kit with the proper locator pin on the Italeri kit. 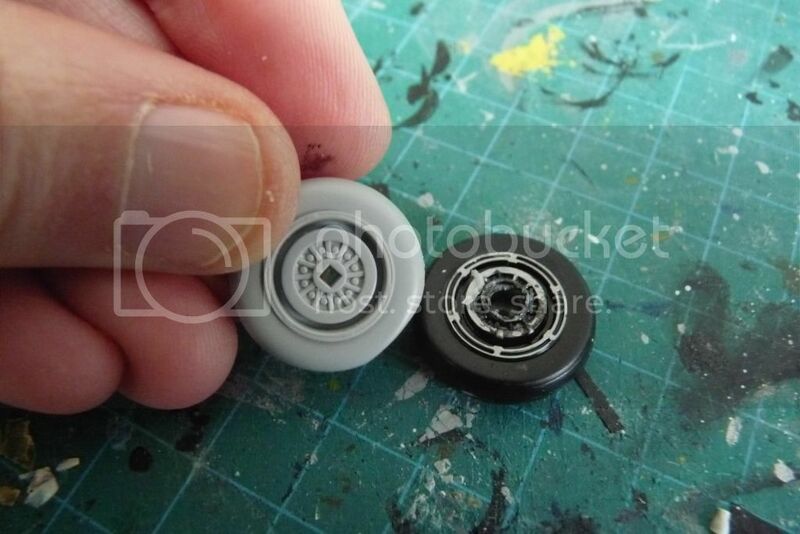 Measuring the wheels, they seemed quite similar in diameter, so I decided to go for it. 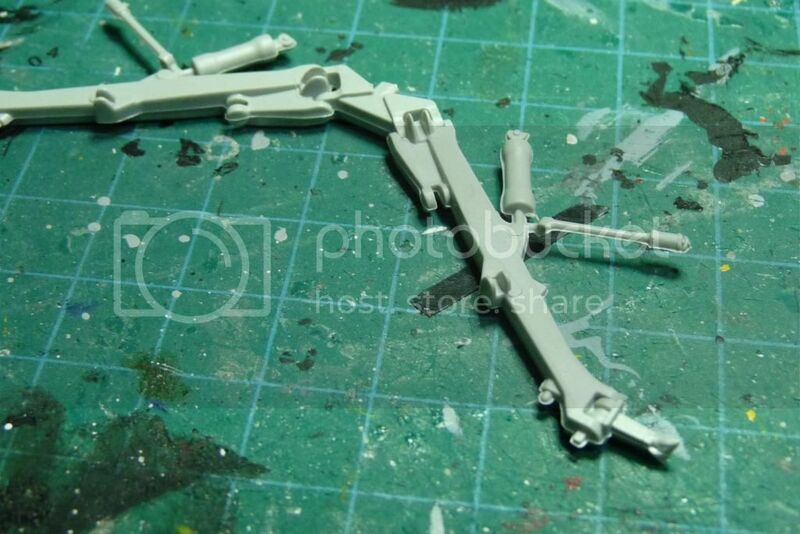 More of Neo's trick; Tamiya extra-thin into the joint, and the wheels came apart. The glue, of course, got on my fingers, and messed up the paint a bit. Now for the moment of truth for the wheels. I fit them, and voila! Perfect diameter. 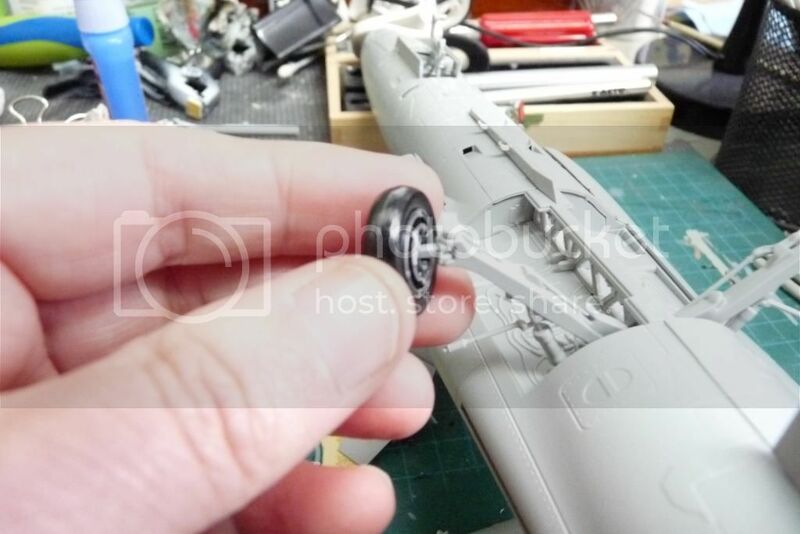 Certainly, the Italeri wheels are "weighted" (with small flat spots at the bottoms), while the Hasegawa ones are round everywhere, but that little detail won't be too obvious. Here is how they fit together. All the little bits around the wheel wells fit nicely. These are nice and solid. I see a bit of flash that will have to be fixed up. One small problem. The engine has a huge accessory gearbox at the front, so it doesn't fit in the tailpipe area when you try to insert it after the tail is glued in place. No big deal; I chopped off the offending bits and the engine fit fine. One thing that is raising red flags, though, is the fact that it seems to be a bit of a tail-sitter with the engine in place. 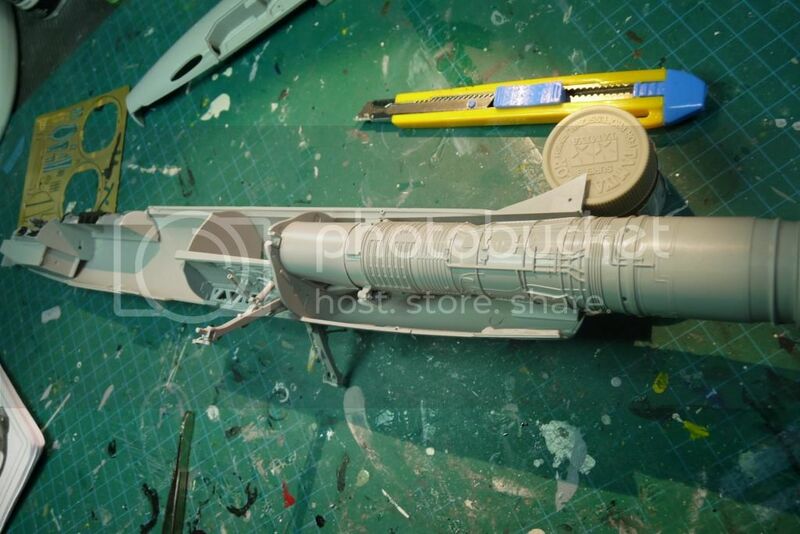 I will add some weight inside the nose cone. 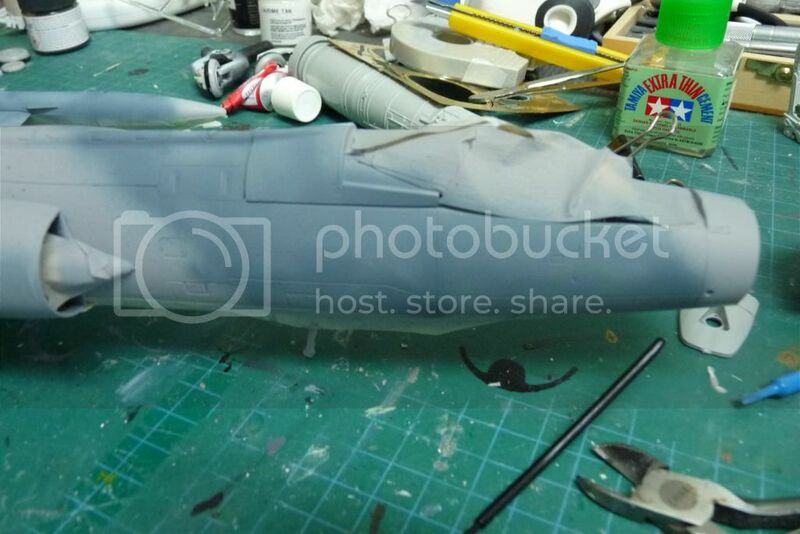 Speaking of the nose cone, I have spray-painted it black, and will dull coat it separately, then glue it in place at the very end of the process. 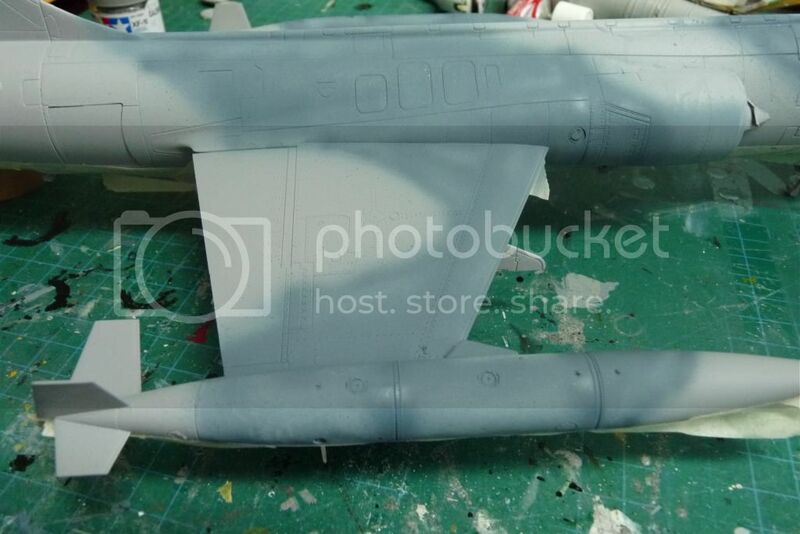 Happily, unlike the Hasegawa kit, the join between nose cone and fuselage is right along the demarcation between camouflage and black radome, so I will have a nice straight line when it is glued in place. 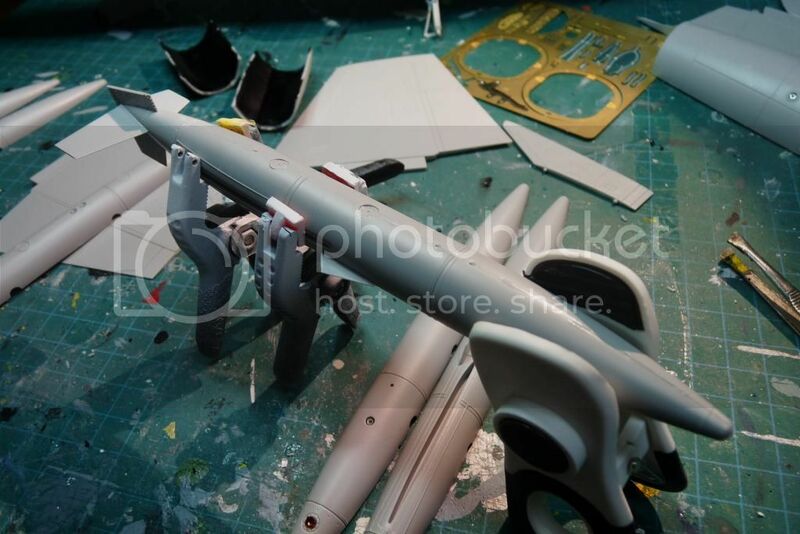 Here is the fuselage almost ready for paint. 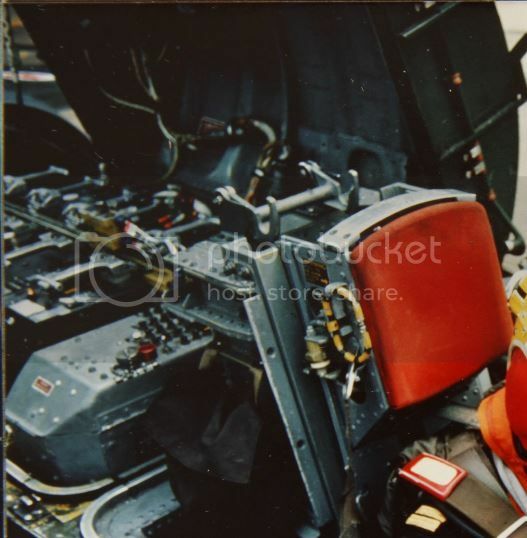 I learned also that it is not a great idea to have glued the ejection seat rails in place early on; I should have waited until the end, because every time I sit the aircraft on its back, these parts come loose and threaten to snap off. I have been using the box or a paint jar to prop it up (unsteadily) while I work on the bottom. I masked everything, and used a coil of tape to hold the e-bay cover in place (might as well use it to "mask" the bay, and paint it at the same time). 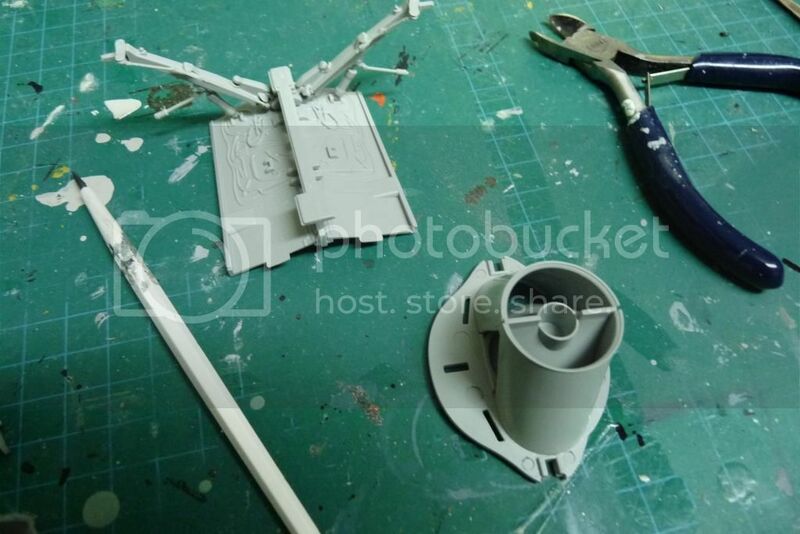 This time, I sprayed Tamiya light grey primer everywhere. This primer works beautifully. 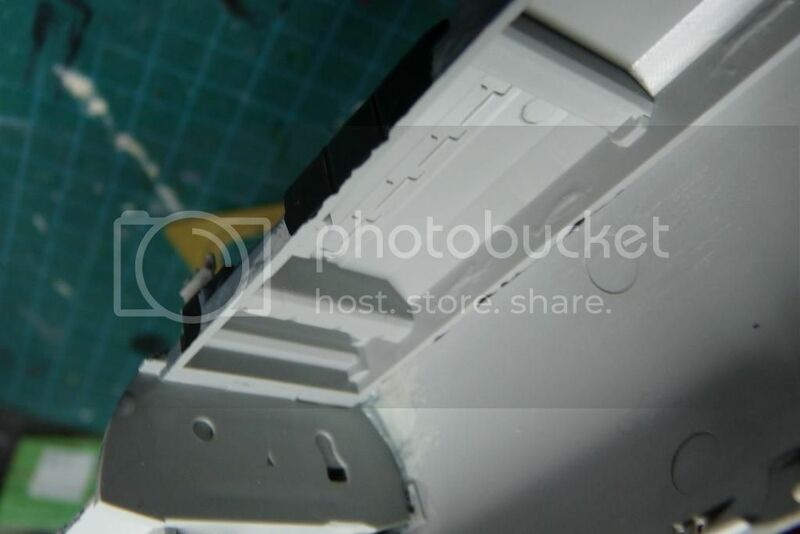 It goes on thinly, and the Tamiya acrylic paint sticks solidly to it through masking and other mishandling. Then I used two shades of the XF-18 blue-grey. One was unaltered (the darker colour), and the other was mixed with some white. I sprayed the lighter blue-grey first, then added the dark colour along panel lines and a light mist everywhere. It came out looking not too badly. I plan to do something similar with the green. 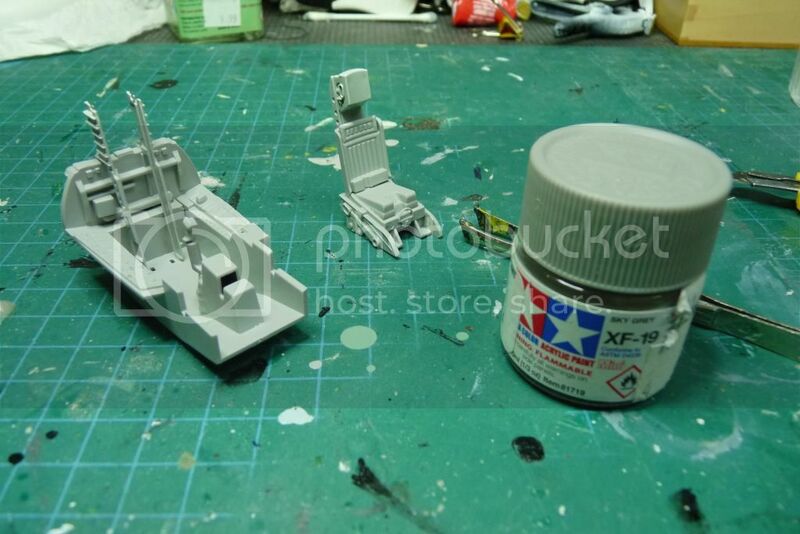 Note the 1/48 kit next to it; I am using it for the camouflage pattern guide, having decided that the decal sheet guide from Belcher's was in error, and I have not looked carefully at the LEM one. Much easier to use a 3D model than to do the old transposition from 3-view drawings to paint, with a mind addled by wine, Cinzano, and too much turkey! The effect of the different shades is more evident in person than it is in the pictures. Today, I spray the green, hoping to recreate the same kind of effect with it. Wish me luck! Great recovery on the wheels and good to hear about the decals. I was afraid Dave at Leading Edge fell off the face of the earth. He was very helpful to me as well on the one Leading edge sheet (out of some 60 sheets that went on with no problem) that was troubled.